Boston Interiors tells ABA, "Let it snow!" BOSTON INTERIORS CALLS ON ABA TO CREATE WINTER WINDOW WONDERLAND. 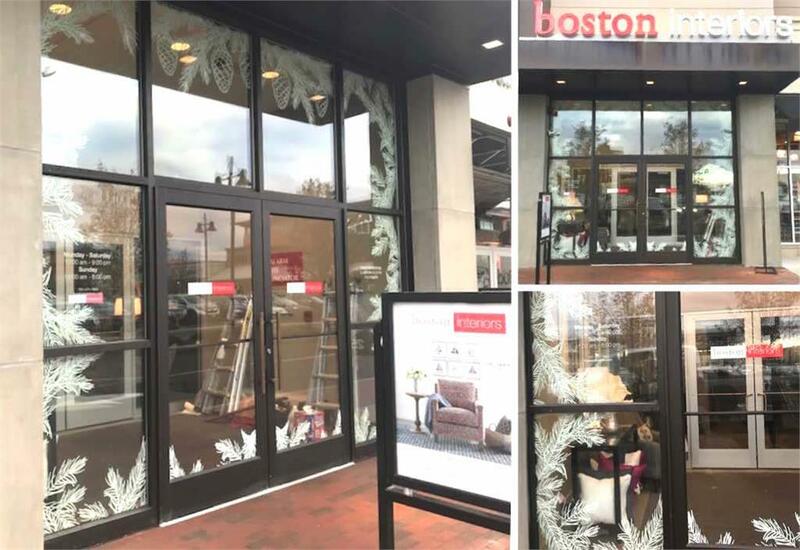 When Boston Interiors was looking for a cost-effective way to dress up their doors and windows for the holiday season, they turned to ABA. "They had their hearts set on a white wintry scene to cover the entire entry way, and thought about traditional vinyl-cut graphics to do it," said Ed Basse, ABA's VP of Sales and Marketing. "Upon seeing the complexity of the pine branches, and the expense it would have taken to cut and remove all the highly detailed waste vinyl, we showed them an out-of-the-box solution using optically clear polyester with white printed graphics and text." The team at ABA ended up wrapping the entirety of the windows and doors and installed it to appear as floating snowy pine branches and pinecones. The digitally-printed white opaque ink printed with the firm's flatbed UV press gave the materials a rich white effect and crystal clear background. Best of all, with the holiday season in full swing, ABA was able to make this all happen within 2 days of showing the initial concept. "It looks better than we could have even imagined," said a Boston Interiors representative. "When we started this project, we weren't sure how to get our windows tastefully done. ABA did a GREAT job! "This is exactly the type of graphics challenge that keeps us energized," said Chip Basse, ABA President. "We're proud of the excellent job our team did with it, particularly in such a short timeframe."